Peaced Together is suitable for women of any age. We have found that it particularly benefits women who find themselves isolated, depressed or victims of abuse. We are in the process of adapting and piloting the course for mixed groups, men-only groups and children and young people. We offer training weekends several times a year for churches and organisations that want to deliver Peaced Together. Peaced Together is a Cinnamon Network recognised project. Churches may be able to apply for Cinnamon micro-grants to help with the cost of running the course. Where did Peaced Together come from? Peaced Together is part of Community Resources, an organisation established by LifeLine Church to grow creative solutions to local issues. It helps local people establish projects that will benefit their community. We are currently piloting a Creative English version of Peaced Together in partnership with FaithAction This will make the course accessible to women who are speakers of other languages. We are also developing a Spanish translation of the course. 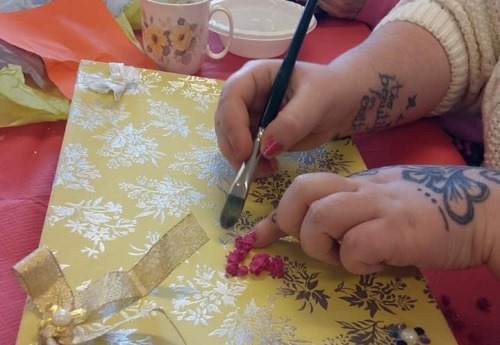 While doing the course, many women discover a passion for creativity and want to continue developing their skills beyond the end of the ten weeks. Speak to your course trainer for more information about further opportunities in your area.